Characters on the cover: the Robot Devil, Leela, Fry, Bender, Professor Farnsworth, and Zoidberg. 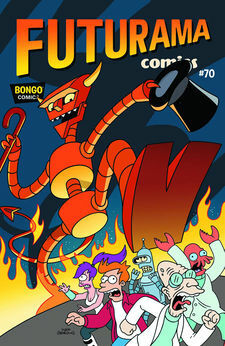 "The Devil and Professor F." is the seventieth comic issue, released 26 February, 2014 in the US. Bender returns to the Planet Express headquarters after a solo delivery of cargo (which he failed to deliver) due to the rest of the crew coming down with comet cold, which was accidentally given to them by Dr. Zoidberg. Tired of suffering from the symptoms, they ask the Professor for help, suggesting he could try to invent a cure. The Professor goes up to his lab and tells himself that he too old and addled to solve the dilemma, claiming he'd sell his soul to be young again. Suddenly, the Robot Devil appears, offering the Professor a deal: he will take his soul and make him young again, on the condition that he can never practice science again. The Professor accepts immediately, packs a hovercar and leaves Planet Express and the rest of the sick crew behind. The Robot Devil, however, plans to follow the Professor and wait for him to break their contract so he can take him to Robot Hell. While on the road, Bender reveals he has been asleep in the Professor's luggage, and the two of them head off to gamble at casinos, with the Robot Devil keeping a close-eye on the Professor. The Professor wins a large sum of money while playing roulette, so he & Bender get an expensive apartment room (with Bender also getting some robot floozies and a pet white tiger). However, the Professor injures himself earlier in the day while lifting weights, and having no time for Bender's loud and obnoxious ways, goes to bed. Two weeks later, back at Planet Express, everyone has recovered from comet cold, but each of them sturggles to do certain tasks without the Professor's help. Cubert claims he will take control (as he is the Professor's heir, son and clone), but this only makes matters worse. Meanwhile, the Professor and Bender are in The Berkshires, Massachusetts, visiting a spa. The Professor tricks Bender into getting into a "relaxing capsule", which is really an escape pod, and sends him back to New New York. The pod later crashes into the Planet Express hangar. The Professor then enjoys a day flying in New Paris, before returning to visit everyone at Planet Express. Things around the building still haven't improved, and the tractor beam malfunctions and starts to pull a meteor towards the building. Hermes asks the Professor for his help in turning off the device, but the Professor refuses as he can't use his scientific abilities. Suddenly, the Robot Devil appears, stating he is only there because Robot Hell is being fumigated. Cubert accidentally sets off the building's secuirty system, trapping everyone inside, including the Robot Devil, causing him to also ask for the Professor's help. Reluctantly, the Professor reverses the polarity of the tractor beam, saving everyone and also turning him old again in the process. The Robot Devil tells him that he is going to Robot Hell for breaking their contract, however, the Professor reveals that he signed the contract in Cubert's blood. Outraged, the Robot Devil says he'll take him to the Court of the Damned, but the Professor reveals that he already owes his soul to three other devils (three being the limit of souls you are allowed to owe). The Professor summons the other three devils, who are still trying to work out who gets his soul, and tells them that the Robot Devil is also after it too. Not wanting to complicate things even more, they chase the Robot Devil out of the building. Now that everything is back to normal, the Professor treats everyone to a frogurt cup, but says that he can't help thinking that he has forgotten something. It is shown that Bender and his pet tiger are still trapped inside the escape pod in the hangar. Zoidberg: The laundry unit is on the fritz! It's turned my jacket pink! Now no one will respect Zoidberg! Scruffy: Ere comes the dawn, will Scruffy shuck this mortal coil? I reckon so. Cubert: Oops! I must have accidentally set off the building security system. We're locked in! Leela: It worked! The beam is sending the meteor back into deep space! Fry: Hooray! It's someone else's problem now! The Robot Devil's bus has a poster on the side for "Grown-Ups 317", a reference to the films Grown Ups and Grown Ups 2. Fry mentions an illness called "Boogie Wookiee flu", a reference to the Wookiee species from the Star Wars franchise. When the Professor becomes young and prepares to leave in his hovercar, the entrance to Planet Express is on the opposite side of the building. The Robot Devil claims that the Professor will go straight to Robot Hell if he breaks their contract, but shouldn't he go to regular Hell? When the Planet Express building's secuirty system locks everyone inside, the Robot Devil says that he is also trapped in there with the rest of them, however, earlier in the story, he is seen appearing in the Professor's lab out of thin air, suggesting he could easily make himself appear somewhere outside of the building. This issue was first known from the back of the previous issue. The gap between issues is twice as long as usual. In "Planet X-Press Men", the Professor is known as Professor F.
The Professor claims that he always keeps a spare supply of Cubert's blood on hand in case he needs an emergency transfusion. The Professor has promised his soul to three different devils. Interestingly, all major members of the crew appear except for Amy. This page was last edited on 16 September 2014, at 20:53.